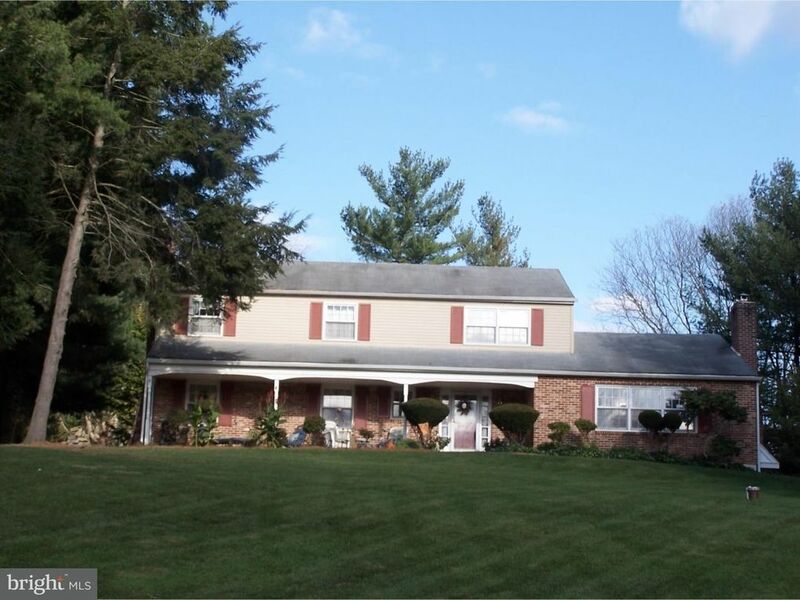 Don't hesitate...Charming two story colonial perched high on a hill in wonderful Middletown Township. Generous foyer with marble floor welcomes your guests. Formal living room with raised hearth, brick fireplace leads to formal dining room with French doors to 'four season' sun room with vaulted ceiling, skylights and Jacuzzi room. A large eat-in-kitchen features custom cherry cabinetry, pantry, homemaker's desk, Corian counters and sink, ceramic back splash and floor, stainless steel appliances, and outside exit to deck. Family room has full wall brick raised hearth fireplace with insert, recessed lighting and wet bar. A study/den/5th bedroom and full bath complete the main living level. Upstairs the main bedroom has plenty to offer. Room for a sitting area, two closets and full bath. There are three additional bedrooms, two linen closets and pull down stairs to attic. The basement is full and finished with an exit through the laundry room or garage. The open front porch (40' x 7') gets plenty of afternoon sun and spectacular sunsets. Sunrise can be enjoyed from the deck or sunroom. Features not always found include; natural hardwood floors, clear wood trim, chair rail and crown moldings and raised panel doors, Pella windows (six new in sun room), laundry chute from second floor to basement laundry, newer siding, generator, oversize garage. The shed (20' x 12') has it's own 60 AMP electrical service. With beautiful views in every direction, convenience to Linvilla Orchards, swim clubs, parks and recreation, Award Winning Rose Tree Media Schools and so much more to offer. Seller will provide one year 2-10 Home Warranty. Will this be your new home?